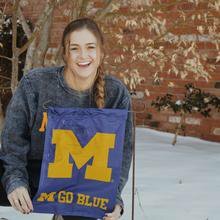 Super excited to announce my verbal commitment to study and swim at the University of Michigan! Thank you so much to my parents, coaches and friends who have all supported me and helped me grow as a person and as an athlete over the years. Can't wait to see where my new journey will take me. Go Blue!